They were congregated around my bird feeder - some feeding on the sunflowers - others gliding up and down the adjacent trees. Maybe this is a common sight for some people, but this is the first time my wife and I have ever observed Flying Squirrels in their natural habitat. Thank you so much, Barry, for sharing your observations with our readers - how lovely for you - I think Flying Squirrels must be delightful, but I have never seen one! 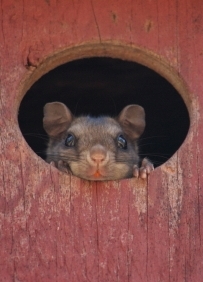 I know that there are Flying Squirrels in the Chatham, Ontario, area - thank you for your submission to our website. I have seen lots of photos of them and nature movies, but not up close.